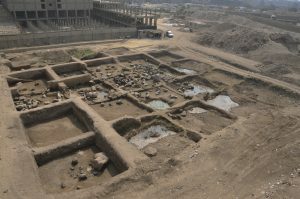 The largest part of the site at the western gate of the main temple is overbuilt by residential buildings in the west, the north and the east. And even in the south a large shopping mall has been built since 2002. In addition the level of the ground water table is constantly rising from season to season. The Supreme Council of Antiquities (SCA) started digging sondages in 2001 and discovered many architectural elements. But none of them were found in situ. Some of these objects offered evidence for building activities in the late Middle Kingdom and subsequent periods. In the autumn of 2005 a joint Egyptian-German cooporation reached the layers of the late Middle Kingdom and Second Intermediate Period (ca. 1700-1600 BC). Core drilling revealed strata of the 6th Dynasty. Also in this season 13 squares (each 10 x 10 m) were excavated. This was expanded to a total of 27 squares in the following seasons by the SCA. From 2012 – 2015 the focus of the excavation shifted to other areas but the work in area 200 was continued. Bread moulds and beer jars, dating to the 4th and 5th Dynasties, and even pottery from the Middle Kingdom were found. Decorated ‘fish plates’ from the time of the Late Middle Kingdom were discovered, too. A large number of so called talatat-blocks, showing the name of the god Aten or the royal family, are evidence of the activity of Akhenaten – the heretic king – in the temple precinct of Heliopolis. Several fragments of life-size and over life-size statues made of red granite were found during all seasons. Although these fragments belong to the temple of Ramses II, these statues originally were made in the Middle Kingdom and were re-used in the Ramesside Period. Since the autumn of 2015 the fragments of the statues were documented by the so called Structure-from-Motion-Method to reconstruct the number and context of the statues. 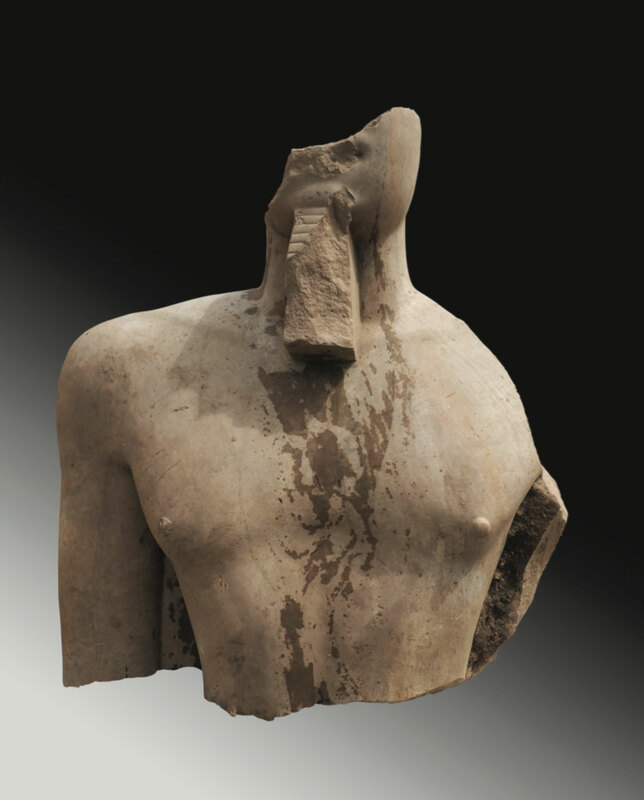 One of the latest discoveries we made are two fragments of a colossal statue of King Psamtik I (664-610 BC). They were found near a foundation of a statue in the western part of area 200 / Suq el-Khamis, close to modern residential buildings. The larger fragment is the torso of the statue with part of the inscribed back pillar. The inscription mentions the so-called Nebty name of the King, which is “Nb-a”. The other fragment shows the partly preserved crown and head of the statue. The statue is made of quartzite (silicified sandstone). The fragments may have belonged to a standing or a seated statue. In the first case, the statue would have measured about 11m in height. A seated statue would have been ca. 8m high. In autumn 2017 the excavation took mainly place on area 200. At the end the area should be completed and be handed over to the Aw-Quaf. The objective was to dismantle two statue bases (in squares K23 & K24), to examine a pit of mameluke times (square I24) and to remove the remains of a former colossal statue (also in square I24). After the initial cleaning of the squares, another statue base (square K25) came to light. In order to investigate the mameluke pit, the statue of the king had to be lifted out first. To accomplish this task, we were supported by colleagues from the Grand Egyptian Museum (GEM) and borrowed a big crane. The dismantling and documentation of the statue bases took up most of the time and also meant the greatest financial expense. Instead of a few days the venture lasted almost the entire campaign. Again, the ladies and gentlemen from GEM were a great help. Each of the two outer bases (K23 & K25) were build out of three layers of large, different sized limestone blocks. From the central base (K24) only the superstructure – an inner frame of silicified sandstone and an outer frame of small limestone blocks – as well as the upper four layers could be lifted out due to the groundwater level. In contrast to the other bases this one was built out of equally sized limestone blocks. It is assumed that this was the base of the colossal statue of Psamtik I, found in spring 2017. At least two further layers couldn´t be removed without taking major risks and have to remain in place. On the one hand they are situated too deep down and on the other the adjacent houses are located too close. After dismantling the bases, a sondage of 2 by 4 m was dug south of the middle base. Hereby many statue fragments of different material were found only a few inches below a thick layer of clay. These include the right arm of a larger-than-life statue of red granite, a fragment of a healing statue made of black granite, the claw of a sphinx made of silicified sandstone with a reconstructed length of approximately 18 m and about 1920 fragments of silicified sandstone, which, like three toes, may belong to the statue of Psamtik I. Also the fragment of a back pillar – possibly also part of the same statue – have been recovered. Presumably, the statues to which these fragments belong were destroyed by fire and later buried in the pit during restoration works. The Greek historian Strabon speaks of a fire in the temple of Heliopolis. Perhaps these fragments are evidence of that very event.